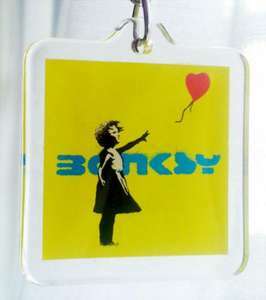 Banksy keyrings, 9 different, solid plastic. Someone mentioned about it on banksy fridge magnets topic, but I think some people missed it. Minus 10 and 0 comments why? I suppose that someone know where can we buy it with better price? Stocking fillers for me, thanks. Heat added. Me too - I won't vote either way, couldn't imagine wondering round Home Bargains and thinking.......'hmmm, they're nice I might have one of them'! ooh can you say trademark infringement.